Belfast Film Festival 2019 is nearly here! Ten straight days of cinematic wonders await as Belfast Film Festival runs from 11th-20th April 2019. This years festival sees 90 features and 80 shorts being screened with 34 different countries being represented. Add into this Belfast Film Festival’s continued commitment to the F-Rating and I’m convinced (and mildly biased) in declaring my home city’s right to hosting one of the most diverse and eclectic festivals around. There is so much to see and the program bulges with big films with star names, independent films from Northern Ireland and some of films weirder eccentricities via the Twisted Cornea and Altered States sections of the programme. There are also guests a plenty with Robert Carlyle, Lenny Abrahamson and Bollywood icon Amir Khan all set to attend. So after a long intensive read through the programme, elimination of potential clashes, a film festival pass purchase and a schedule in place; these are a few of my picks and where you will find me over the festival period. Written by Tess MCGowan, directed by Shelly Love and produced by Louise Gallagher, the film will open this years festival and centres around the strained relationship between immature mum Pamela and disapproving daughter Allegra. When Pamela become pregnant following a drunken one-night stand the relationship between mother and daughter is put to the test. A Bump Along The Way plays at Movie House, Dublin Road on Thursday 11th April at 7pm. Thirteen year old Kayla endures the tidal wave of contemporary suburban adolescence as she makes her way through the last week of middle school - the end of her thus far disastrous eighth grade year - before she begins high school. Habving heard great things about this film from reviewers and critics in the States, this was always going to been of my picks! I’m expecting coming of age in the digital era here with a more tech savvy, social media awareness than those that occupied the spaces of Clueless and Mean Girls. Eighth Grade plays at Movie House, Dublin Road on Wednesday 17th April at 7pm. Showing as part of the NI Independent section of the programme a title like this was always going to intrigue and attract me. How could Films andFaith resist? The Salvation Door shows at Movie House, Dublin Road on Sunday 14th April at 1pm. Animal Kingdom depicts a man’s voyage into the deep recesses of the very film that projects him, affecting its construction, progression and physical stability. While stranded in a large forest where day and night interchange at any moment, he discovers two natives who have begun their transformation into animals. Even with that description in the festival programme, I’m still not sure what to expect here. However when a films described as a spiritual odyssey I was always going to be intrigued and compelled to check it out. Animal Kingdom plays at QFT on Sunday 14th April at 3pm. Relatively unknown, there is an emerging movement changing the way death is approached in contemproary Britain. Death is never easy to talk about, look at or contemplate. A documentary that may look at how we challenge those ideas jumped out from the programme as something that will no doubt give me something to chew over and wrestle with. There will be a panel discussion, featuring director Rehanna Rose, following the film and these panels always add to the experience as you learn why the film was made, the thought process and the impact it had on those involved. Dead Good plays at QFT on Saturday 20th April at 3pm. These are just a few quick picks from what is an extensive programme. There are many more great films, events, talks and experiences to be had across the festival period (11th-20th April). So grab a programme, circle your picks and I will hopefully see you there. Belfast Film Festival turns eighteen this year and, now as a fully formed adult (sort of), is showing no sign of slowing down but is maturing wonderfully into one of the most broad and diverse festivals around. Ok I'm a Belfast boy so I may be biased, but with 178 films available over ten days, the prevalence of local talent and 20 films which fall under the F-Rating a case can certainly be made. Big events such as the festival opening night and special guests (this year acclaimed director Ken Loach will receive the festival's Réalta award) are always a draw but where are the other gems to be found? I've scoured through the pages, thumbed down the pages and attempted to avoid timetable clashes to bring some of my picks for this years festival. Ex Libris screens at Queens Film Theatre, Sunday 15th April at 1pm. When a renowned architecture scholar falls suddenly ill during a speaking tour, his son Jin (John Cho) finds himself stranded in Columbus, Indiana – a small Midwestern city celebrated for its many significant modernist buildings. Jin strikes up a friendship with Casey (Haley Lu Richardson), a young architecture enthusiast who works at the local library. As their intimacy develops, Jin and Casey explore both the town and their conflicted emotions: Jin’s estranged relationship with his father, and Casey’s reluctance to leave Columbus and her mother. Columbus screens at Strand Arts Centre, Tuesday 17th April at 8:30pm. Parvana is an 11-year-old growing up under the Taliban in Afghanistan in 2001. When her father is wrongfully arrested, Parvana cuts off her hair and dresses like a boy in order to support her family. Working alongside her friend Shauzia, Parvana discovers a new world of freedom- and danger. With undaunted courage, Parvana draws strength from the fantastical stories she invents, as she embarks on a quest to find her father and reunite her family. Equal parts thrilling and enchanting, The Breadwinner is an inspiring and luminously animated tale about the power of stories to sustain hope and carry us through dark times. The Breadwinner screens at MovieHouse - Dublin Road, Wednesday 18th April at 7pm. Filmed over five years, this documentary examines violence committed by groups opposed to the peace process in Northern Ireland. One night Majella, took her teenage son to be shot in both legs. They all live within the same community in Derry where paramilitary rule is still rife and policing is carried out by the community rather than the government agencies. How do you bring your son to be shot? How does a community respond? When do wars really end? Director Sinead O'Shea will take part in a Q&A following the screening. A Mother Brings Her Son To Be Shot screens at Queens Film Theatre, Thursday 19th April at 6pm. This is only a snippet of what is available at this years festival, I could have made many more picks but you can explore the full programme at the Belfast Film Festival website. elfast Film Festival runs from 12-21st April 2018. So it's that time of the year again. My favourite time of the year in fact. Belfast Film Festival time!! As always the programme is jam packed with great premieres, fun events and a plethora of film from across the world. This year the festival welcomes John Cusack to Belfast and to celebrate this screenings of Max, High Fiedlity and a Q+A have all been scheduled and sold out. So if you don't have a ticket to any of those where should you go? Festivals are a great chance to see films long before their cinematic release. Some gems may still be in pursuit of distribution so it may be you never see them again! I've browsed the program and among the 'bigger' films here are my picks for the festival period. Mark Cousins and Neneh Cherry team up for this superb ‘is it a doc, or is it fiction’ film. Cherry’s Alva is a character whose life mirrors some broad facets of her own (an artist with an African father and Swedish mother). She’s trapped under the steely grey skies of Stockholm, struggling with debilitating depression, the result (we soon learn) of a traumatic incident a year earlier. Due to give a lecture on the city’s architecture, she bunks off and takes us through the city, exploring buildings, bridges, a cinema, with each place revealing more about her life and state of mind. Any time a Mark Cousins film appears at Belfast Film Festival it is the first thing I mark in the programme. Unique and always compelling there should be more acclaim given this wonderful talent. This is my must see of the festival! Stockholm my Love screens on Wednesday 5 April 4pm at QFT in Belfast. Tickets available here. This is exactly what Carol Fraser did after befriending Chetan, a local rickshaw wallah working in the northern city of Manali in Himachal Pradesh, India. At the age of 76 she embarked on a mission to build a house for herself, Chetan and his family of dalits, formerly known as untouchables. Together they hatched a plan to build the house of their dreams, funded by an altogether alternative money making scheme, a journey into the high Himalayas and the friendship of a taxi driving monk. This is a unique story of faith, courage and magical thinking. A story of how the dream of finally having her own home, and a family to support her comes true for an elderly English teacher. It’s ‘The Marigold Hotel’ meets ‘Lost Horizon’. Reading that description from the programme you can tell why this is a Films and Faith pick. A story of faith, courage and magical thinking is certainly a description that appeals. 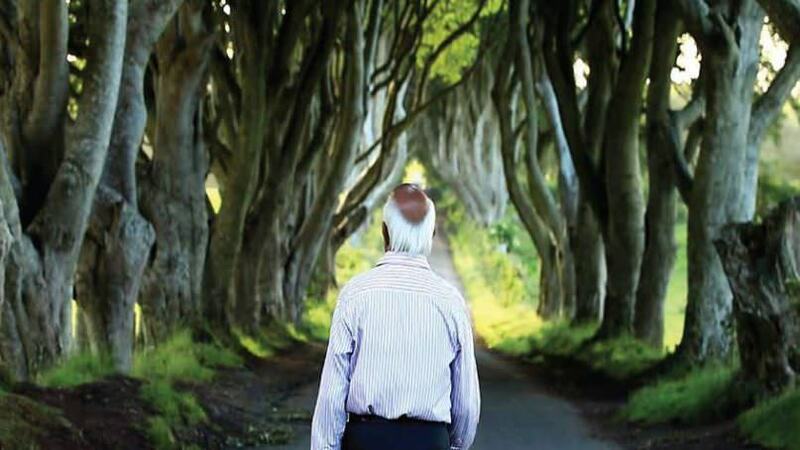 Outcaste screens on Sunday 2 April, MovieHouse Dublin Road at 4pm. Tickets are available here. With the refugee crisis still a very present issue this film may help us to see the humanity that is denied refugees by certain sections of media and society. Films and Faith is always interested in a conversation about the 'others' in society. With such a talented director at the helm I fully expect to enjoy this topical and relevant film. The Other Side of Hope screens on Sunday 2 April at the QFT at 6:45pm. Tickets are available here. After a successful live recording last year Banterflix is back atThe Hudson Bar! Hosts Jim McClean and Neil Sedgewick (me) will be joined by special guests and local filmmakers as they look through the festival’s programme and chat about some of the movies they’ve watched this year. One of my highlights from last year podcasting in front of a crowd was terrifying and lots of fun all at the same time. So we're back again. It would be great to see some of you there so come and say hello. Tickets are free but you do have to book as the venue will only hold a certain amount of folk! The Banterflix Live Podcast recording is on Saturday 8 April at 11am at The Hudson Bar and you can book tickets here. Belfast/N. Ireland readers if you at the festival let me know what you see. I hope you find good stories to laugh at, cry with and be challenged by. For the full festival programme check out the Belfast Film Festival site!